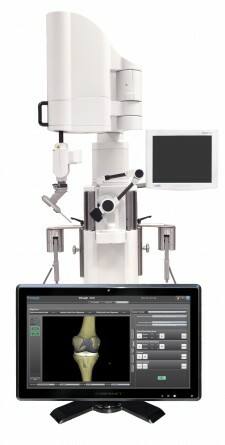 FREMONT, Calif., December 11, 2017	(Newswire.com) - THINK Surgical Inc., a global medical device manufacturer of the only active robotic surgical system for orthopaedic surgery, announces that it has received CE Mark approval for the TSolution One® Surgical System, bringing active robotic precision to Total Knee Arthroplasty (TKA). The TSolution One Surgical System first entered the European market in 2015 when it received CE Mark approval for Total Hip Arthroplasty (THA). Currently, the system has 510(k) clearance for THA in the United States and four centers are enrolling patients for an IDE clinical study for TKA. Earlier in the year, the TSolution One Surgical System received Korean-FDA clearance for both THA and TKA. It also received approval for sale in Israel by the Ministry of Health for THA. Obtaining the CE Mark represents a key milestone towards continuing the global commercialization of our differentiated robotic technology and our commitment to improving patients' lives and partnering with surgeons to transform orthopedic surgery. CEO of THINK Surgical, Inc.
3P. F. Choong, M. M. Dowsey, and J. D. Stoney, “Does accurate anatomical alignment result in better function and quality of life? Comparing conventional and computer-assisted total knee arthroplasty,” Journal of Arthroplasty, vol. 24, no. 4, pp. 560–569, 2009. 4Barrack RL. Dislocation after total hip arthroplasty: Implant design and orientation. J Am Acad Orthop Surg. 2003;11(2):89-99. TSolution One® is a registered trademark of THINK Surgical, Inc. THINK Surgical develops, manufactures, and markets the only active robotic surgical system for orthopaedic surgery.